You are here: Home / Africa / Rwanda / You Gotta Uganda! With the gorillas still hanging in the trees clinging to the steep volcanoes behind me, I made my way to the Uganda border. It’s this last stretch of 100km that hasn’t seen interntational support funds — for the road at least. 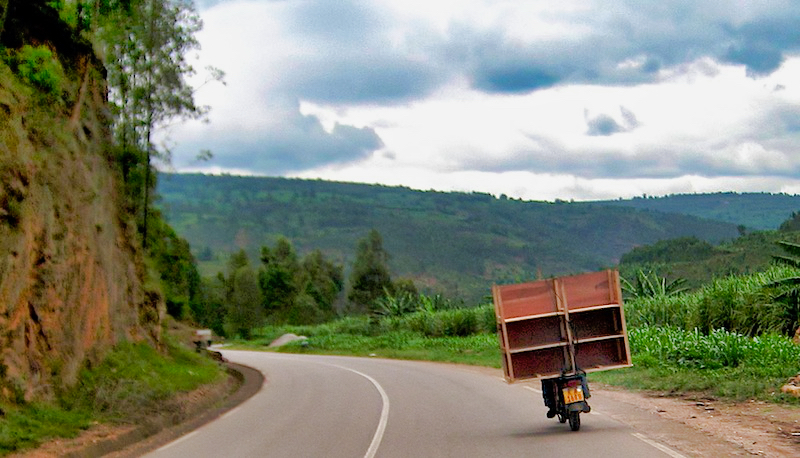 The road from Kigali to Katuna in Uganda ranks up there with one of the worst pot-holed roads of the journey. But the scenery? Stunning. Riding through a valley with traditional villages, rondavel homes and terraced and sculpted fields of rice, corn, tea and coffee. The scenery continued and got better after making yet another border crossing into the Republic of Uganda. Unlike Rwanda where a VISA was granted with no fee, Rwanda took me for fifty bucks. Plus about twenty bucks for road taxes. 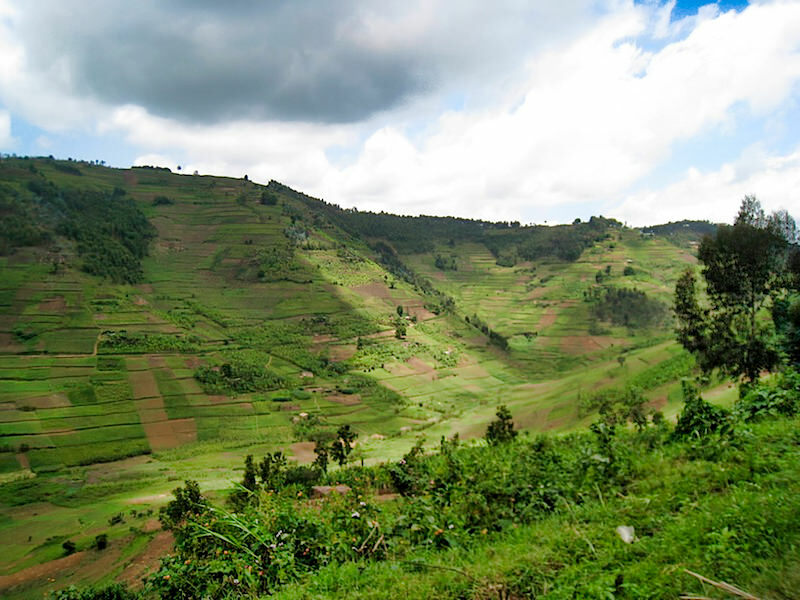 So feeling $70 lighter I made my way to the peaceful hamlet of Lake Bunyoni passing through the small town of Kabale which is surrounded by a number of small lakes where terraced hills tumble steep to the water and small camps, lodges and bungalows dot the shores and hills. 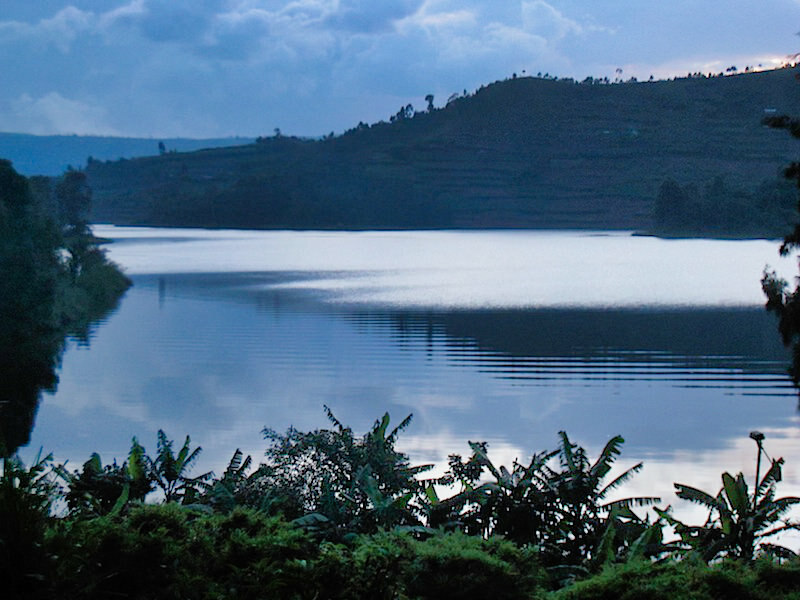 I chose Lake Bunyonyi about 10km outside of town up and down steep roads. 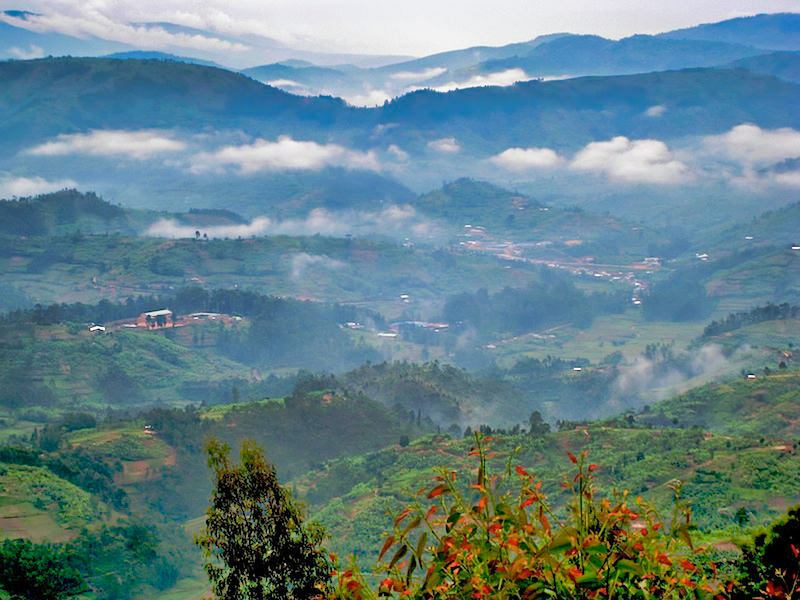 The lush green and misty cloud covered hills made exiting Rwanda and entering Uganda a cool and atmospheric feeling. It’s hard to take time alone on just about any road in Africa. 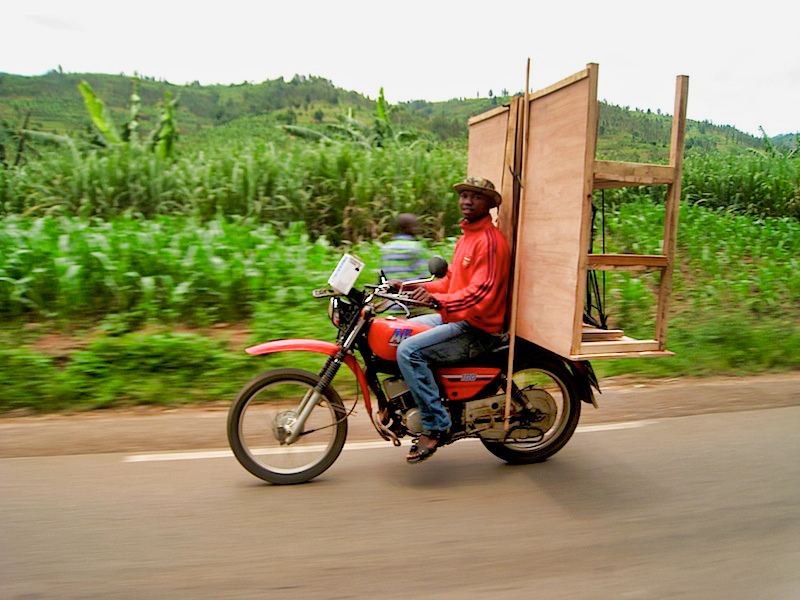 No helmet but with a delivery to make. Not sure I’d take the job! 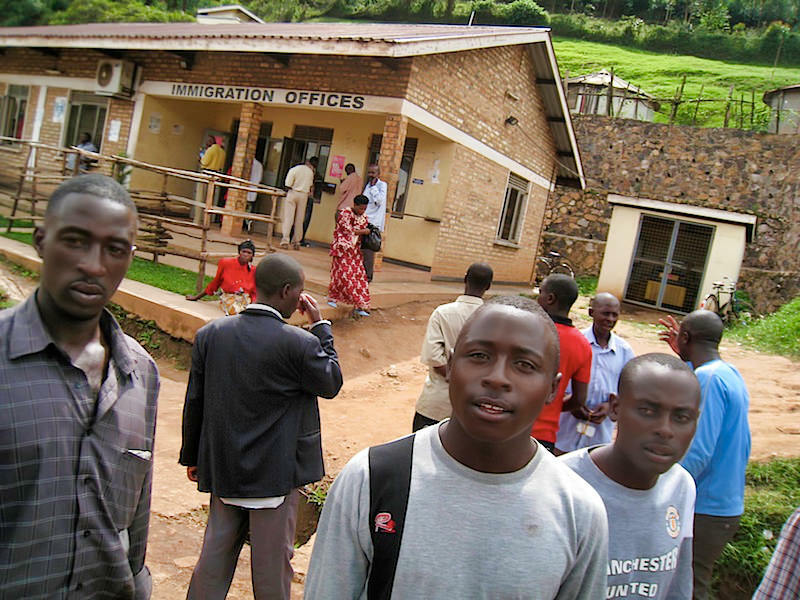 The aid flows into Rwanda and Uganda. 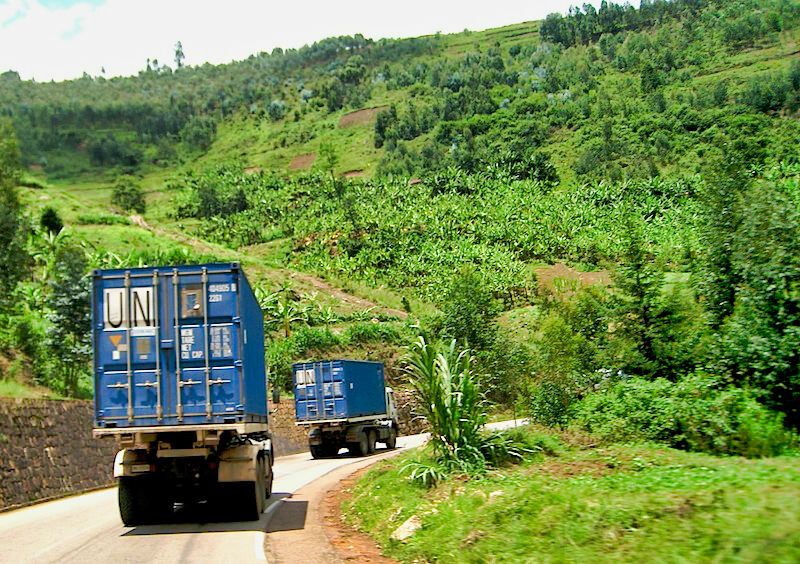 Convoys of trucks carrying full-size containers proudly exhibited the UN moniker. Stopping in town to take advantage of the Standard Bank ATM machine, as usual I was nearly accosted by vendors selling newspapers, cellular pre-paid “top-up” cards, fruit and more. But it was two young girls that really ushered my Ugandan indoctrination. Both carrying woven bamboo baskets atop their heads and about 10 years old, we chatted briefly roadside by the ATM. Future lawyer and president here in Uganda. “And I want to be president,” the shy girl with an extra bout of confidence piped. For perhaps first time in my journey through Latin America, Brazil and Africa have I sensed a desire to exceed and be someone in such young people. Often I’ve hypothesized one major problem with many impoverished people from cultures different than my own is the lack of perceived opportunity by its citizens. You’re raised by a goat hereder, you will be a goat herder and you will rear goat herders — a perceived preordained existence with no other future. Yet in the US and other westernized cultures we are instilled with the concept of fulfilling our potential and dreaming to be something. “What do you want to be when you grow up?” It’s in our psyche but absent in those of many other cultures. 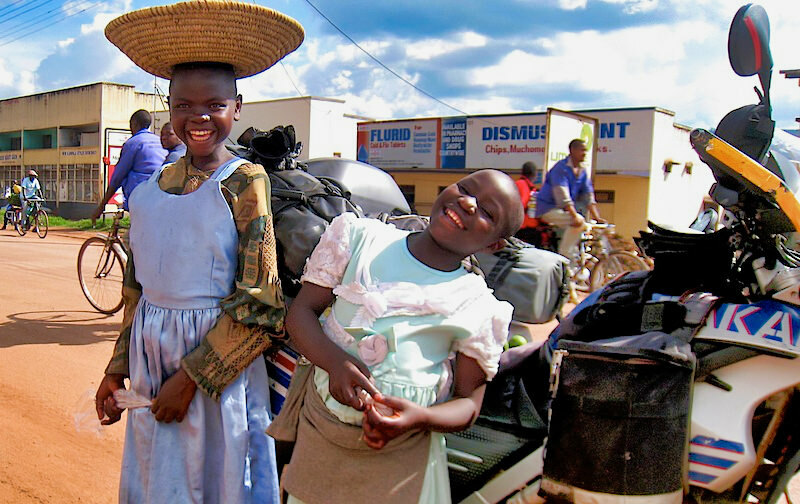 Yet on this dusty Ugandan street these two girls capture my heart and share their dreams with me. And it’s not a ploy to sell tangerines. But I couldn’t resist. I bought some fruit from each and shared it with an elderly woman walking down the street and with the boy selling newspapers who guided me to the turn off to Lake Bunyonyi. 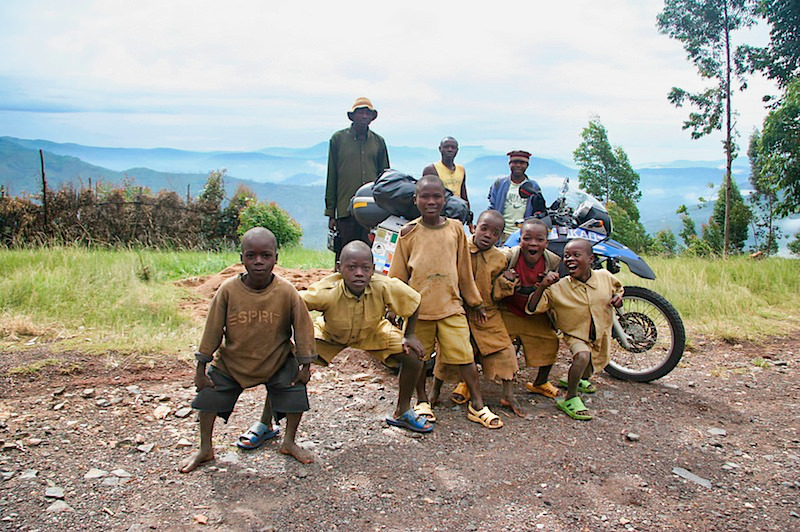 The road to Bunyoni hugs the mountainside, is badly rutted and now in the rainy season always a bit dicey. But it didn’t rain until the morning I left and therefore I avoided any otentially muddy pitfall. Pictures just can’t capture the magic of one of Uganda’s most magical lakes in a region studden with dozens. At the Bunyonyi Overland Camp I met Tom from Canada who’d been on a group trip with about 20 bicyclists gearing to complete the Cairo to Cape Town overland journey. With the trip booked and underway when the crises in Kenya kicked in, the itinerary and route changed whereby offering the riders a two-week hiatus before reconvening in Dar es Salaam. Tom and another rider opted to go to Uganda and Rwanda while others went straight to Tanzania. After seeing my photos of my Rwanda mountain gorilla experience, Tom was making plans to head to Volcano National Park. An F650GS owner himself, he confided that later in the year he and a buddy are planning a motorcycle journey to Baja in Mexico. Perhaps I’ll see him passing through after I return to Southern California later this year. 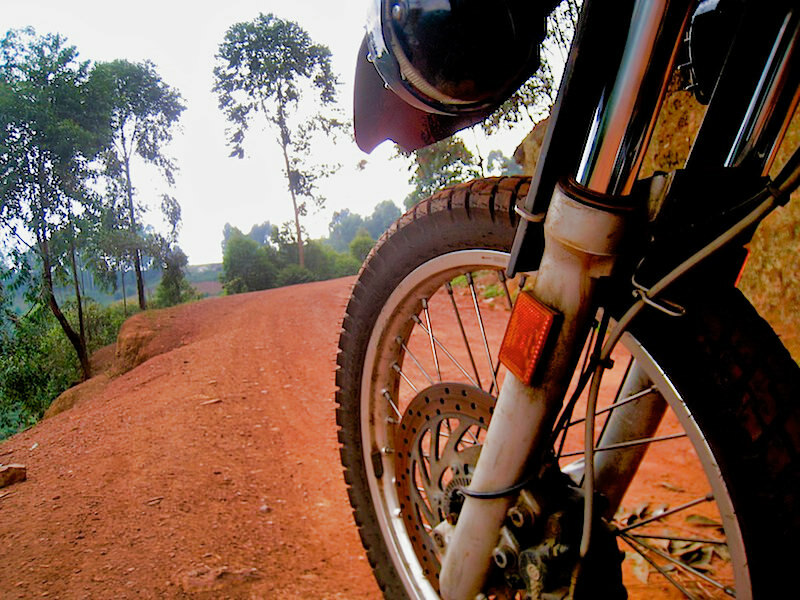 https://i0.wp.com/www.worldrider.com/wp-content/uploads/2014/08/IMG_7646_2-tm1.jpg?fit=600%2C450 450 600 allan https://www.worldrider.com/wp-content/uploads/2014/08/worldrider_logo_white_border-trans1.png allan2008-03-08 16:19:152008-03-08 16:19:15You Gotta Uganda! Indian Food and Genocide: An Unlikely Mix? In Africa? It Doesn't Get Any Cleaner Than This. The Lucky One? Things Uganda and/or Rwanda and/or Africa.